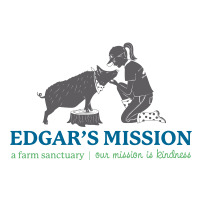 Edgar’s Mission Farm Sanctuary is a not-for-profit farm sanctuary with a vision for a humane and just world for all. The It's Only Natural arrangment is a beautiful animal friendly arrangement, which arrives in a wooden crate box to add a bit of rustic flair. It's Only Natural to support animals in need! about 60 km north of Melbourne. encourage people to expand their circle of compassion to include all animals.